What Is the Cost of Social? Most social media tools are free, so how do you budget for social media marketing? The cost of doing social is more closely measured in the time it takes to generate awareness, prepare your content, engage with your audience, monitor what others are saying about your brand and learn new tools and techniques as they emerge. Connecting with your customers on their network of choice is half the battle. While every company needs to maintain a presence on LinkedIn, Facebook, Twitter and YouTube, the “Big 4” may not be where your customers live. Look for niche networks, like ResearchGate for scientists, that target your specific customer demographics, and review your social analytics to confirm that your existing followers are your real customers - not just one-time visitors who have no long-term interest in your company. Make sure that your customers can find you on the most common social networks, but drive traffic to 2-3 networks where you will spend the majority of your marketing efforts. Develop unique and engaging campaigns for your choice social networks, and repurpose content to maintain your presence on other networks. Targeting the audience that will result in the most engaged network takes strategy, and growing highly-targeted networks often involves researching and finding individuals one at a time. Know your goals and determine an engagement, and ultimately sales, funnel for your social campaigns. What percentage of your followers engage with your brand? What percentage of your followers respond to your social calls-to-action? What is your conversion rate for each of your social platforms? Do your "brand evangelists" have anything in common? You can use this information to better engage your existing followers, and to determine targets for future growth. Many companies hesitate to join in the social conversation because they don't want to give their customers an open forum for complaints. Even if you are not active on a social network, that does not mean your customers are not talking about your brand - positively or negatively. Regular social monitoring (at least daily) keeps you in-the-know and empowers you to respond immediately to customer concerns. And when your customers say something nice about your company, share it, comment and build brand loyalty. There are a variety of ways to leverage technology across each aspect of your social interactions. Dashboards available through social networks help you analyze your traffic, reach and engagement. Monitoring tools, such as Google Alerts, can keep you up to date on news accross the web, social and otherwise. Tools such as Ed.it2 allow you to post and track the success of your content, comparing social to overall website traffic. Finding the right tools for your company will increase your efficiency in daily social activities. As your social networks grow, so will the amount of time it takes to interact with your audience. Plan ahead and be prepared to grow with your social networks. On March 15, 2014 we launched our new website at offwhite.com. Here’s the story behind it. Website development is one of the most visible skills we bring to our integrated marketing platform. Our expertise in crafting, launching and managing highly productive websites for our clients continues to broaden. For our own website rebuild we used the same process we would deploy for you and your company. If you are considering an investment in a new website, it will be helpful to examine how we did ours, and why our process works. Our range of services is so diverse, and the nature of our consultative relationships so unique to each of our clients, that even a modest portfolio of work does not fully represent the value of what we do at OffWhite. At the same time, by showing you what we’ve done for others, we are offering a few tangible expressions that reflect highly crafted marketing strategies. Thus, what you see on this website does not begin to approach what you get from OffWhite. Our online portfolio exists to illustrate integrated marketing communications programs that arise from strategic thought. The OffWhite website is designed to accommodate multiple screen sizes across the major browsers. Using embedded device queries our website automatically adjusts its layout to screen sizes ranging from 320 to 2,560 pixels while maintaining functionality and visual continuity. This versatility is achieved using responsive design. Here, our website adapts its style sheets based on the screen size of the device being used to view the site. We also detect whether the device has Retina or standard display so that the device loads higher or lower resolution images to maximize the user experience and accelerate loading time. Responsive design is important to website architecture because of the exploding use of mobile devices, wherein mobile traffic will surpass conventional (desktop) traffic in 2014. 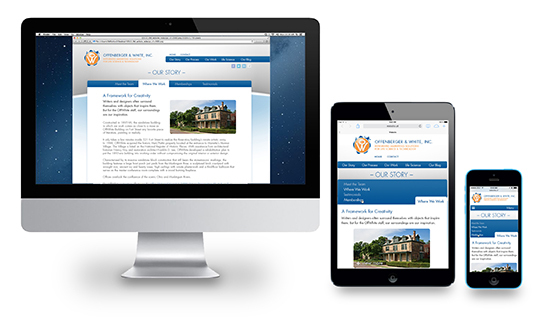 Our website is as easy to navigate on an iPhone, iPad or other mobile device as it is on a high-resolution 24” iMac or PC. Our navigation retains its inherent rank in the visual hierarchy. Information displayed in a three column format on a desktop monitor automatically stacks itself into a single column on a mobile device. We’ve eliminated the need to pinch zoom or scroll horizontally to read a line of text. Fonts are automatically sized for readability, not pixel size. Within this process, the creative design remains aesthetically correct, while permitting all search engine algorithms to do their work to increase our Search Engine Optimization. Analytics from our site and our client sites offer statistically significant information critical to our design process. For this reason our website is formatted especially for the most commonly detected screen sizes of 320, 480, 568, 768, 1024, 1200+ pixels, and for the most recent three versions of the most commonly used browsers. These include Internet Explorer, Safari, Firefox and Google Chrome. As new versions or these browsers are introduced, we will optimize our platform to accommodate them. To observe how our website responds, view it on a desktop computer, then view the same page on an iPhone, iPad or other mobile device. Change the aspect ratio from portrait (vertical) to landscape (horizontal) and watch it adjust itself. The OffWhite website is powered by Ed.it™2, our digital marketing platform that brings large scale enterprise capability to small to medium-sized businesses. For a webinar offering a behind-the-scenes look at Ed.it™2 in action, contact Bill White or Jane Cirigliano at 800-606-1610. 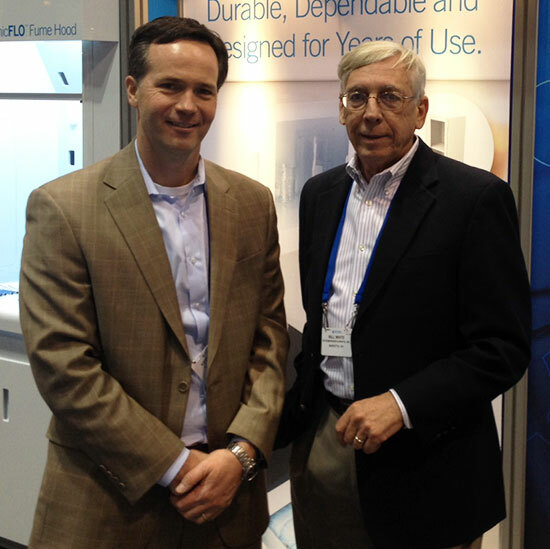 Kevin Theis, DAI Scientific, with Bill White at Pittcon2014. While planning a visit to a major technology trade show in Chicago last week, we printed a map of the exhibit booth locations and highlighted the companies we wanted to see in the exhibit hall. Up one aisle, down the next, introduce ourselves, shake hands, leave a business card. That was the plan. Our attempts to get through the exhibit hall in the time allotted to us over two days were thwarted at every turn by interruptions from people we knew from current or previous relationships. We literally ran in to these people. A nuisance? Hardly. These impromptu conversations in the middle of the aisle were the most productive and beneficial meetings we had all week, and the most fun. In most high tech industries there are a core group of “lifers”, people captured by captivating technologies who never escape the gravity of curiosity and discovery. We see them again and again and, over the years, we often work together here and abroad for companies who depend on our acumen for marketing, brand management and communication. When introduced to a potential client in a trade show booth last week, I remained silent - comfortably embarrassed - as I listened to words of recommendation and encouragement from an influential industry insider speaking highly of the OffWhite staff. It was a personal endorsement earned through loyalty to shared clients and performance in the trenches. It was proof that we have done our jobs well as our work was validated by a sentence or two from someone who simply wanted the best for his company. The best, he said, was OffWhite. At OffWhite there is no better reward than a happy client. Those who benefit from our work are usually on the front lines of sales, delivering the message on the street while a marketing team builds the offer and articulates the value. When we can empower these street fighters to call for OffWhite air cover we can expect to share in their success and live to fight another day. We can expect them to say they want OffWhite on the job because what we do works. Our trip to Chicago was rich with planned and chance meetings, new faces and challenges, long days and great dinners with friends. Most of all, it was a chance to celebrate the free-enterprise system amidst a tapestry of invention and innovation. For those who continue to recommend us to your extended business family, thank you. Now that baseball season is finally here, we take a moment to salute Chris Hlubb, our website programmer, and wish him well in support of his beloved Oakland Athletics in 2014. 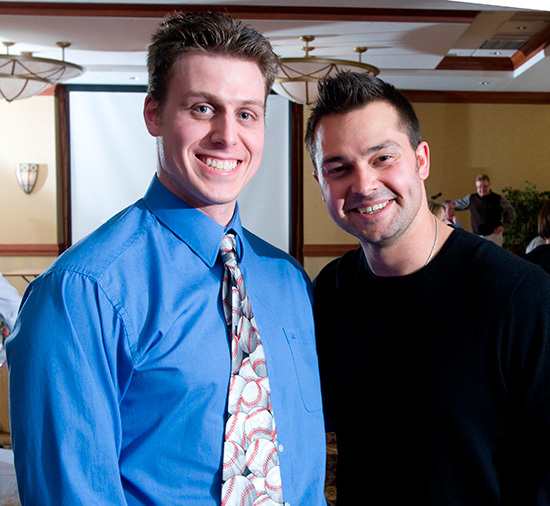 Here is a great shot of Chris delivering some advice to local baseball great Nick Swisher, formerly with Oakland, ChiSox and the Yankees, and now anchoring first base for the Cleveland Indians. We expect Chris will be in Cleveland May 16-18 as Nick and the Indians host the A’s in a three-game series.